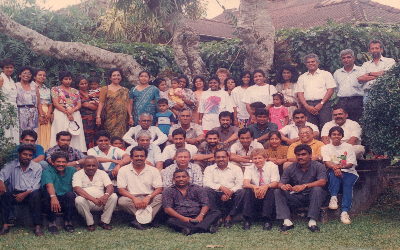 The Lions Club of Aluthgama Bentota was chartered in 1991 as a club in District 306A, in the Multiple District 306 Sri Lanka with twenty Charter members. The Charter President of the Club was Lion Paddy Withana. Aluthgama and Bentota are two adjacent towns situated in the western coastal belt of the island. A popular tourist resort frequented by many tourists who enjoy the beaches Sri Lanka is famous for. Majority of the members who formed the club therefore were hoteliers attached to the many hotels in the area. The friendships formed by these members with the tourist who visited the country annually were the source of aid in the form of spectacles, wheel chairs, medical equipment and monetary donations. The club celebrated 25 years of service in 2016. Through the handwork and dedication of these men and women the club has become one of the most active clubs in the district and has also won many district awards. Together, the Lions Club of Aluthgama Bentota for the past 25 years has been fulfilling the Lion Motto: "WE SERVE"
at Brief Gardens, Beruwala, Sri Lanka"